Self-contained laboratory sized pulping system supports rapid development of processes. Designed AND manufactured AND tested AND CERTIFIED to current ASME Pressure Vessel Code Section VIII, Div 1 for assurance of quality and safety. Compare! Easy on and off cover, no leakage during temperature ramp, no shear on seal. Compare! Optional steam jacket heating for fast rates of temperature rise up to 25C/minute. Compare! Computer graphical user interface with H-Factor cook control. Compare! All 316 Stainless Steel wetted materials. Circulation heating with minimized loop volume. Liquor flow is returned directly over the center of the chip basket to ensure optimum distribution of the liquor throughout the batch. Compare! Standard high power for faster ramp times than the competition. Compare! 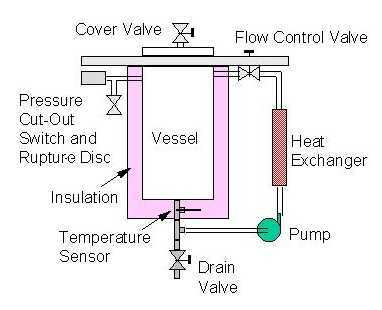 Redundant safety features; vessel temperature limit, heater power limit, heater temperature limit, over pressure cut-out switch and rupture disc. Compare! the features, we're either the first or only company to offer these features with new features constantly being developed. Batch and Continuous Process Simulation with metering pump option. Custom sizes and any number of vessels with interconnection. Metering pump for simultaneous liquor injection / extraction at operating temperatures and pressures. The Laboratory Digester is a self-contained circulation type pulping pressure vessel system. The vessels are available in the standard ten liter size or sizes ranging from one to twenty liters, with practically any size available. The vessels are designed, manufactured, tested and certified to the current ASME Pressure Vessel Code Section VIII, Div 1. This is your assurance of proper design for longevity, uniform build quality and safety in every system. The vessels have easy to open and close covers that are designed to not leak during temperature ramping. The design of the covers do not impart any shear force to the gasket causing premature gasket failure. A seal-less magnetically coupled pump circulates the liquor through a 3000 watt electric heater. The heated liquor returns to the top of the vessel where it is distributed over the pulp. The liquor return is directly over the center of the chip basket to assure even distribution of the liquor. The circulation flow is variable by means of a variable speed motor contoller on each pump. An optional flow meter is available for indication of the actual circulation calibrated in liters per minute. The flow enters the vessel on top of a removable stainless steel basket in which the wood chips are placed. A perforated weight is supplied for placement on top of the wood chips to ensure chip packing and uniform distribution of the liquor. A valve in the top cover provides a means for application of steam or for the evacuation of air. The dual vessel system enables the user to generate steam or to preheat liquor in one vessel for use in cooking in the other vessel. An RTD temperature sensor capable of measuring to 0.1° C accuracy is located at the bottom of the vessel, directly in the flow stream of liquor for optimum temperature sensing. Cook programming and control is by means of Windows compatible software. The software features graphical temperature and pressure indicators, Temperature vs. time graphing, Proportional, Integral and Derivative (PID) type control with and auto-tune feature, and H-factor cook control (the cook may be automatically terminated when a user defined H-factor is achieved). One or two vessels are mounted on a steel frame with casters for ease of movement. Multiple digester frames may be located in close proximity for configurations with other vessels. An optional metering pump facilitates simultaneous bi-directional liquor exchange between vessels. The metering pump is sized for your application and flow rate requirements. The metering pump flow rate is infinitely variable by the pump stroke adjustment or the standard variable speed control. The metering pump option includes remotely controlled solenoid valves that precisely start and stop the flow of liquor through the metering pump. Interconnection of the vessels may be permanent or by supplied quick connect fittings and flexible reinforced hose for rapid reconfiguration. Connections are made to the top and/or bottom of the vessels. 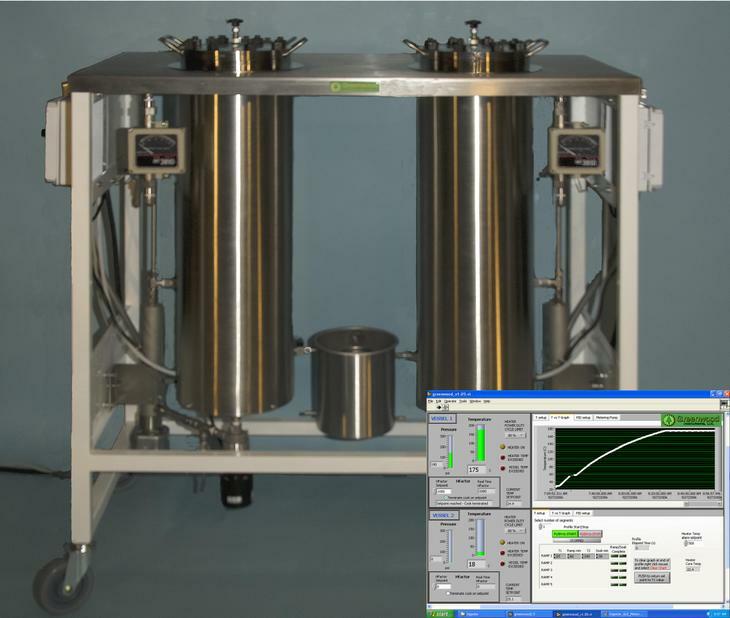 An optional condenser with a pre-determined volume allows liquor sampling during the cook. Please contact us for more information on the existing features of the system or custom designs and options to meet your requirements. What does ASME designed mean to you? 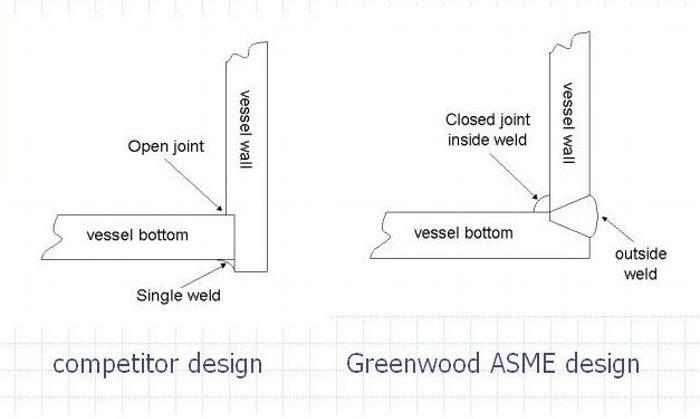 ASME vessels are designed and fabricated so that there are no open seams at welded joints. Joints are not only sealed from the outside but also a continuous bead of weld fills the seam from the inside of the vesssel. This feature eliminates the small cavities where acids can become trapped. Trapped acids will corode the vessel in critical areas and severely reduce the service life of the vessel. ASME designed vessels utilize a compression type seal rather than a piston ring type cover that subjects the 'O'-ring seal to unwanted shear. Vessel covers with compression type seals are easier to install and remove and the 'O'-ring lasts much longer. Unless your digester vessels have these features it is certainly NOT ASME designed. Vessels that are fabricated by an ASME certified manufacturer and are inspected and tested by an ASME representative can earn the ASME stamp (shown below). Every Greenwood Instruments vessel bears the ASME stamp. The ASME stamp assures you that the vessels are not only designed to the current ASME standards but that the vessels are manufactured with traceable material, welded to ASME standards, inspected and tested by ASME personnel. The ASME stamp is the recognition that the vessel has been designed and manufactured to the highest standards and quality.